Ragnar – Floridia Keys is 15 days away and I’m already thinking about my packing list. Fortunately, ShowerPill is one of our sponsors and is supplying us with ShowerPill wipes for each van so that will be a major help in the hygiene department. It’s the hygiene supplement to maintain your freshness while you lead an active, busy lifestyle. One of the “interesting” things about a relay race which goes on for days, is that showering is non-existent sporadic. Added to the lack of showering, is the fact that you are cooped up in a van with 5 other people, who are also in desperate need of a shower. All of whom have ran in the 80 degree Florida heat, for many miles, for multiple legs. Everyone stinks. It’s disgusting. I was first introduced to the ShowerPill wipes when they sponsored our ultra team for Ragnar Chicago (2012). Although, I didn’t actually get to run due to my torn tendon, I did score a couple of the wipes. I wanted to try them but I must admit, I was leary. I never believe that things work like they are advertised because let’s be honest, advertisements sometimes embellish the facts to get us to spend our hard earned $ on something that we just don’t need. Although, I liked the idea of a “shower” in wipe form; I didn’t necessarily know if I “needed” it. Since that day, I’ve used the ShowerPill wipes a lot. I bought a couple boxes on Amazon and they are now my go to product when I need to “freshen up” after a run or race. I also frequently run on my lunch hour at work. Everyone always asks me if I sweat, if I stink, if I shower. Yes, I sweat & stink but there is no time for showering! Pre-ShowerPill, I used either baby wipes, or the Say Yes to Cucumber wipes, for cleaning up. That worked, if they weren’t dried out. If I remembered them. If I wasn’t too nasty. Now with ShowerPill, I only need one wipe, plus I don’t need to carry an entire package of wipes that may or may not be dried out when I need them. And I feel clean and fresh when I go back to work. One wipe, that’s all I need. I think ShowerPill was invented specifically for people like me. People on the “run”. Busy mom’s who run directly from a workout to pick up the kiddos at school. People who have to squeeze a workout into the middle of their work day. People who travel to/from racing events and don’t always have the option of showering off after a major endurance adventure. Relay runners who will spend days in a van with stinky teammates. Regardless of how hectic your life, ShowerPill wants me & YOU to #StayFresh. 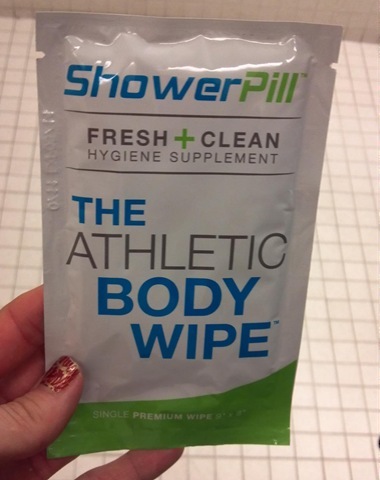 ShowerPill™, it’s the Athletic Body Wipe™. 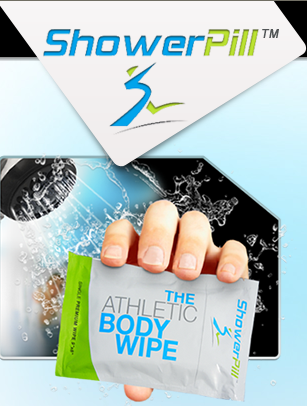 ShowerPill is giving away one box of athletic body wipes to a lucky reader. If you would like the opportunity to win a box, please comment below and tell us in what aspect you would most likely use the wipes. Since the holiday is fast approaching, the winner will be drawn on Friday (December 21st) at 9am. Good luck & please #StayFresh for yourself and all of your friends and family! 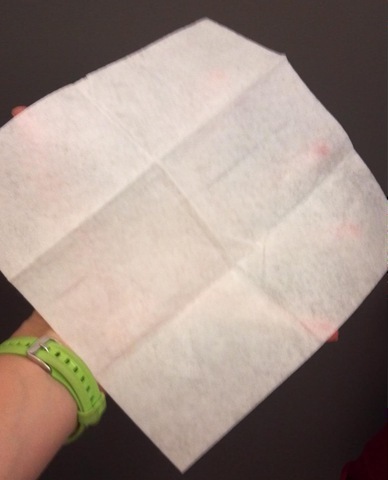 This entry was posted in Cross Training, Cycling, Giveaways, Product Reviews, Running, Triathlon and tagged Athletic Body Wipes, How to clean up after a lunchtime run, Hygienic wipes, ShowerPill, ShowerPill wipes, Stay Fresh by tootallfritz. Bookmark the permalink. These would be perfect for me! I am planning on doing more running before work, and since my work schedule is changing in 2013, I could use these to clean up before going to my desk…or after a lunch hour run! How awesome! I would use them after doing a workout at lunchtime at the office…or just whenever I needed to freshen up the “pits” which seems to be often these days,……..
I’d use them after workouts or runs. Often for my weekend workouts I head right into running errands and I am sure I have offended people with my smell numerous times! These would be helpful after a race/before I home. I would definitely use this for any post endurance race cleanup! I hate driving home all stinky and smelly! I would use them after my long Saturday runs! I have a tendency to throw multiple training pieces together back to back, afterwards, one of these would be great before getting back in the car. I would love to try these! I would definitely use them after running (or the gym or teaching zumba) for when I need to run errands right afterwards! I freakin’ love Shower Pill. I’m always trying to squeeze in as many miles as possible while my little one is at preschool… so I arrive and stand in line as the stinky mom. Yup, that’s me. Why? Because my Shower Pill supply is EMPTY! Help me! I would use the shower pill most likely after running! I went last week after running directly to a bar to see a friend play in a band. I changed clothes but wasn’t able to wipe myself off before going. This WILL BE mandatory at next summer’s Great River Ragnar. I love my friends like they are family, but boy do they stink!!! The Des Plaines River Trail is near-ish my office (just a short drive), so if I had these maybe I would do some lunchtime runs! And maybe I could drag a couple of my co-workers with me! These sound awesome!! I would love to have some to use after I run the Huff 50k. I want this!! I’m running Ragnar soon and would love to try them out before then. These wipes would def come in handy during the Sinister7 ultra Marathon relay this summer. I’ll be getting down and dirty on the trails!! It’s a killer 150km race with a 27hr time limit. I’ll be starting my team off with the first 30km! !